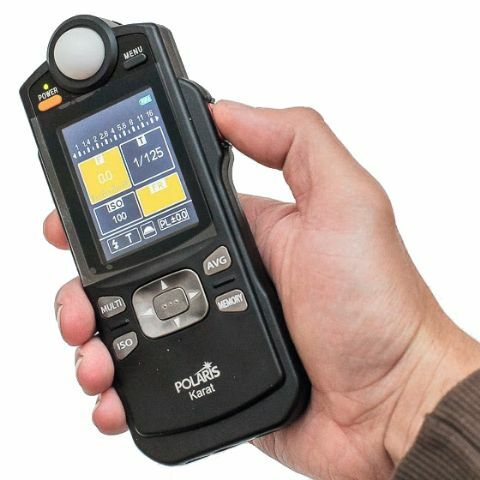 “Long-selling” POLARIS flash meter is a professional meter with world-class features and performance, at a fraction of the cost of comparable models. 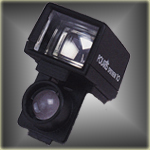 All models are RoHs compliant, Made in Japan. 『Simple, Easy, Tough』 of POLARIS is reborn with adding new features! Easy to see in a large color LCD display, and operation has been further improved with using the Cross Key. In addition, it is a next-generation model that enhance the function of flash light measurement, such as Flash Duration Mode, and Flash Ratio Function. Setting desired Aperture（F）and Shutter Speed（T）find appropriate ISO number. It shows the difference between average value and newly measured value by ΔEV. Useful for checking lighting evenness of backgrounds, and lighting ratio. ■ POLARIS 2 Flash Meter is an enhanced version of the original POLARIS Flash Meter. It offers an on-command backlight LCD display. It is an essential feature when taking readings in a dimly lit situation or when using flash in a studio. By depressing the backlight button located conveniently adjacent to the trigger button, the electroluminescence light is activated and will stay on as long as the button is depressed. This gives you complete control of the backlight feature regardless of the mode being used, whether it is flash, ambient or combined. ■ The new, full-featured professional POLARIS dual5 Flash Meter offers 5 degree spot and incident measurement for ambient and flash light. Extra wide and bright view finder makes easy targeting of subject. It also offers an on-command backlight LCD as well. Eight additional shutter speed available to match the sync speed of virtually any camera. No guessing or searching for a shutter speed close to the sync speed of your camera. It makes it simple to calculate how many times the flash must be fired to achieve a desired f/stop. Oversized LCD display shows all the data and functions clearly and easily, even at full arm’s length. Large “analog” scale for easy fractional measurement. It lets you personalize your flash meter to match your style of shooting. 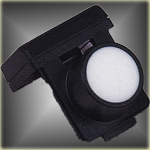 Adjust the flash meter level or return to standard levels with the simple button operation. Power Off： Automatically shuts off power after 5 minutes when not used Turning the meter off or changing the battery will not erase the pre-set program. It changes the POLARIS Flash Meter into a 10°angle spot meter. So you can have an incident-light meter, a reflected-light meter and spot meter all in one! To get an accurate reflected-light reading of particular area of a subject. To get a reflected-light reading from a subject that’s far away. It is used to measure the lighting ration between main and auxiliary light, to determine luminance values and to take exposure reading to flat subject such as painting or copying documents. Quick and Easy mounting!